What is an Utah Sublease Agreement? Utah Sublease Agreement: What Is It? In Utah, a sublease agreement is a legal contract that specifies the specific arrangement between a sublessor, the original signer of a lease and a sublessee, a new tenant who will move in while the sublessor is gone. This agreement may last for a short period of time, such as a month, or for an extended period of time, such as a year; the terms and duration depend on what the sublessor and agree to. Once the agreement is in effect and the sublessee moves into the rental, he or she will have to abide by the same rules of occupancy that the sublessor upholds according to the original lease agreement. One important fact of subleasing is that although the sublessee will be living in the unit and paying rent just as the original tenant did, the sublessor will still be responsible for any unpaid rent, late payments or property damage because his or her name is still on the lease with the landlord. 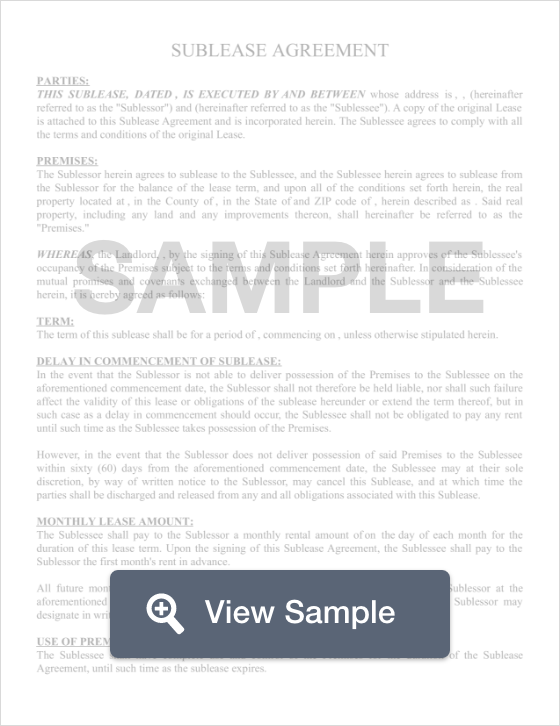 According to the Utah Tenant Rights Act, a tenant must follow the terms of his or her lease. If the lease does not mention anything about subletting, the tenant must obtain written permission from the landlord.